It might not be patio season quite yet, but we‘re soaking in the longer days and springtime weather at these sunny spots indoors. 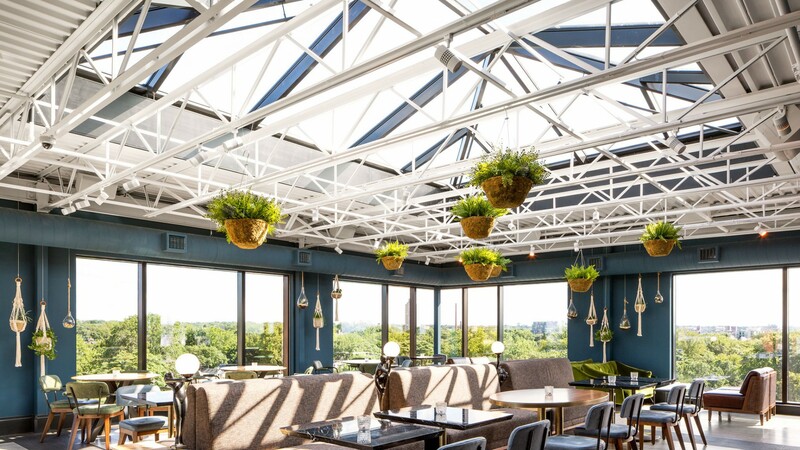 Set on the seventh floor of the Broadview Hotel, the Rooftop features dramatic views of the Toronto skyline and the Don River, with its east end location offering a rare bird’s-eye perspective on the city facing west. The lounge has floor-to-ceiling glass windows and a striking pyramidal skylight, with hanging plants further enhancing the feeling of connection to the outdoors. Buzzy vibes and a menu emphasizing shareable dishes like fried chicken and charcuterie boards make the Rooftop a hip patio alternative – plus there’s a large outdoor seating area for when the weather warms up. Sun seeking among the towers of the Financial District is challenging but your best bet is on the Cactus Club’s third-floor deck. 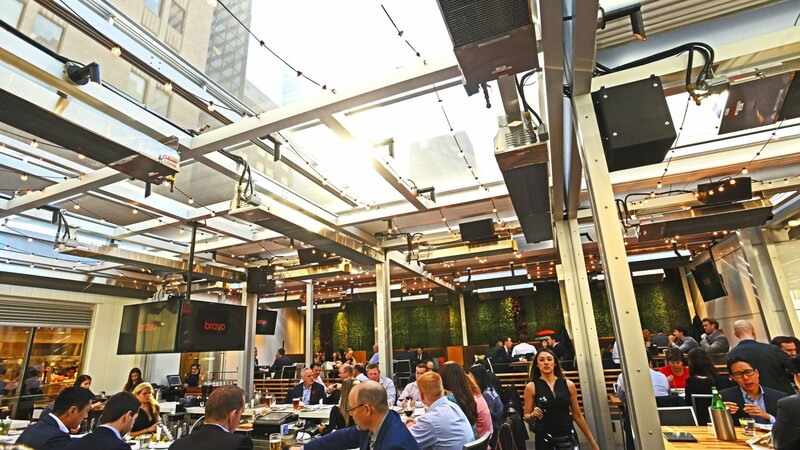 The glass roof is equipped a snow-melting feature for maximum sun exposure, regardless of the precipitation, while ceiling-mounted heaters mimic the deck’s summertime clime when the roof reclines. Private booths and a rotating schedule of guest DJs help to create the upscale clubby feel that this Canada-wide chain is known for, as do the suited folk that stream in after clocking out for the day. 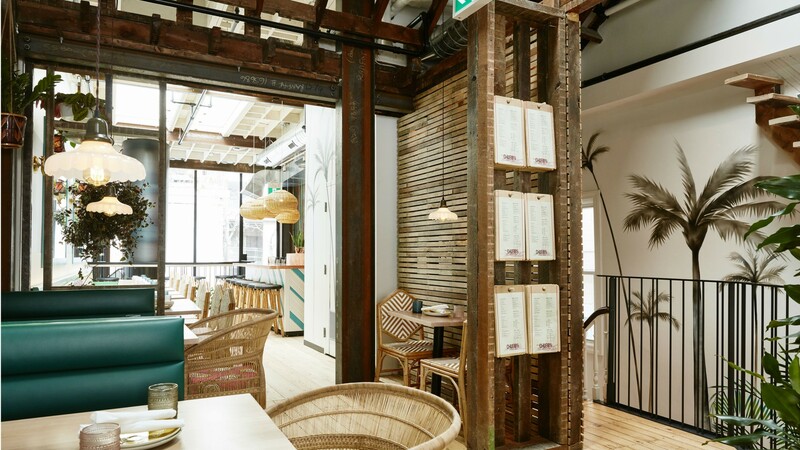 As part of a gut reno to transform a Victorian home on Portland into an airy, light-filled Jamaican restaurant, designers took out the rear wall of the building and added skylights, making its top floor bar area a sunny spot for soaking in the rays. The tropical interior of Chubby’s Jamaican Kitchen keeps the island vibes going, as does its rum-heavy cocktail list (including a fruity rum punch on tap). Peer over the railing and you can get a glimpse of chef Donovan Campbell and the kitchen team firing up grilled fare on the indoor jerk pit. 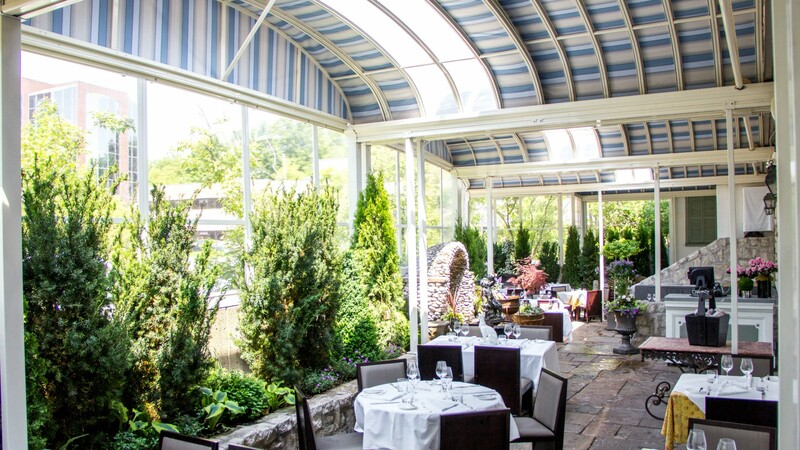 For a classy covered patio experience, look no further than this North York institution. Opened in 1987, Auberge du Pommier is set in a pair of renovated woodcutters’ cottages dating back to the 19th century. Appropriate for its fine dining French menu, the restaurant’s decor evokes a romantic European countryside estate. The restaurant’s sheltered terrace features equally charming, French-inspired decor, accented with leafy plants, flowers and rustic stone. Heaters help to keep the temperature toasty on chilly evenings, while you make your way through the restaurant’s extensive wine list of more than 500 bottles. Sport and concert-goers keen to soak in some rays pre (or post) game can do just that at Kelly’s Landing, located just across from Union Station. 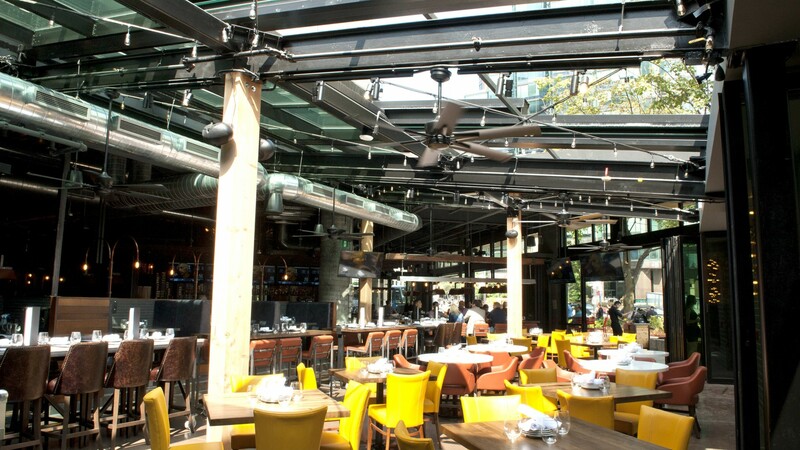 A glass rooftop above the restaurant’s main dining area brings an outdoorsy feel to the space. The roof is retractable too, which comes in handy when the temperature cooperates. The Kelly’s Landing menu of pub staples is standard with some global flavours (Moroccan-style chicken curry and a club sandwich built with naan bread). But really, we’re here for the wine (stored in a fancy 800-bottle display fridge) and draft list (24 beers on tap). Clever design and construction doubled Gusto 101’s all-season dining capacity. 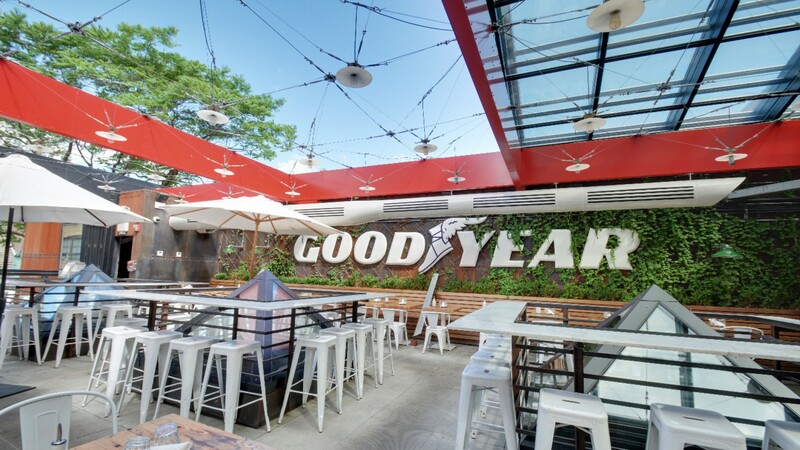 Its glassed-in rooftop patio, which sits atop the original former auto-body garage, creates an industrial-chic environment including an oversized Goodyear signage as a loudbut cute nod to the building’s former life. It all makes a fitting environment for tucking into the restaurant’s modern Italian fare.